Traveler Reviews for Private Tour in Mexico City, Distrito Federal, Mexico by Tour Guide Mario P.
Great option that avoids the larger crowds, heat and the shopping/mezcal tastings of many other tours. Very knowledgeable and provided time to explore on our own. He was punctual and we were back in city by 1 pm. TOUR GUIDE RESPONSE: You were a great travellers and make my job much easier. Mario was a pro--arrived on time, communicated his arrival, and had bottled water in the car for us. He expertly navigated us through the entry and tour of the ruins. We also enjoyed his commentary on the various sites in CdMX as we drove out of town. Mario is very professional and knowledgeable. He took good care of us and gave us excellent information, not only about Teotihuacan but about Mexico City in general. What a genuinely nice person! We would definitely hire him again. Plus the restaurant he suggested was excellent. TOUR GUIDE RESPONSE: I learn from my clients during the last years of my life working as a guide and I gladly share them. This tour was the highlight of my trip and the perfect amount of time in Teotihuacan. Mario was clearly very knowledgable and passionate about everything from the car ride to the site and back. There wasn't a moment where he wasn't giving us amazing insight and tips. We enjoyed the perfect balance between education and opportunity to explore the site as a couple. It was all perfectly planned out. Mario made our trip incredible and I will recommend him to friends and clients visiting the city! TOUR GUIDE RESPONSE: We both feel the same pride of our roots and we see that they were intelligent and with many advanced knowledge for their time. Saludos! Mario is very passionate about the history of Teotihuacan and Mexico as a whole which made the journey even more enjoyable. Would definitely recommend him as a tour guide for tour trip to the Pyramids! TOUR GUIDE RESPONSE: You are very kind with me! Very comfortable ride and a great pace through the park. Half day was legit perfect but you'll need to be able to walk quickly and be happy to only scratch the surface of the history. Which was exactly what we wanted! Info provided was great and the private car ride allowed us to ask questions and learn other things about Mexican history, culture, food, etc. TOUR GUIDE RESPONSE: Hello Hedy, As you said YOU DIDN'T UNDERSTAND ME where I was to meet you and why you didn't call me at the moment to question me again the instructions that I gave you before and don't looking for me in another place an hour later. I was waiting for you at meeting point for gave you the next part of your tour. Thank you! Book with Mario! Seriously, do it! He arrived on time at our AirBnB location. He brought us safely to Teotihuacan and back to our room. Along the way he indulged us with his wealth of knowledge regarding Mexico City, his country and the people residing there both past and present. His passion for understanding and teaching us the history of his country was evident from the moment we began the drive to the pyramids. We really enjoyed our time spent with Mario and would highly recommend his services. TOUR GUIDE RESPONSE: I really enjoy travelling in my wonderful country. I'm waiting for your next trip. Mario was an excellent guide at Teotihuacan and throughout the entire process. 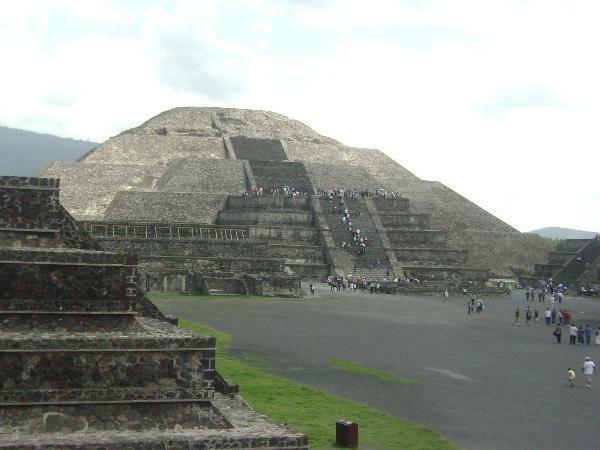 He responded quickly to some last-minute logistical changes I had before the date of the tour, gave us valuable historical and contemporary information about Mexico City and Teotihuacan the day of the tour, and dropped us off safely at the end. Mario is a true professional that also feels familiar, and he pays attention to every detail. I highly recommend taking a tour with Mario! TOUR GUIDE RESPONSE: Hello Nancy, I enjoy travelling all over my country and show you the very best it has. I hope see you soon in our country with your baby! Mario was extremely knowledgable about Mexico City and Teotihuacan! It was a fantastic trip and an absolute must do activity if you are here. TOUR GUIDE RESPONSE: Christopher, I enjoy travel with you and show you the best of rich heritage of prehispanic cultures and later spanish culture and finally our mexican culture. I hope see you again enjoy another part of my great country. Thank you! TOUR GUIDE RESPONSE: Thanks you are very kind. Fantastic guide. Mario was especially consideratewith my 83 year old parents never ending questions and mobility limitations. Bravo Mario!! TOUR GUIDE RESPONSE: All my clients are important, it doesn't matter the age they have, always receive the same quality of my service. Great tour! Mario arrived on time and the vehicle was almost brand new. He took us to the destinations we discussed and gave us a great tour (fluent in English). He also gave us good recommendations of places to see in the city. TOUR GUIDE RESPONSE: I invite you to do others tours all over Mexico and know our rich heritage! So long! Mario is simply put, a fantastic guide. We felt very lucky that we was available on short notice. We learned so much; not only about the Piremedes, but CDMX in general on the drives in/out of the city which were almost as fun as Teotihuacan itself. His background as a retired architect made the tour extra special- especially if you are into small details (e.g. angles, cracks, and drainage!!!). Would not hesitate to call him again on our return for another tour. Great photo angles too. Thanks Mario! TOUR GUIDE RESPONSE: Thanks to you, you are a great travellers and I'll be wait you and remember I have experience a very much other tours all over Mexico please ask me and I'll customize your favorite tour. My family and Matias and me send you un Hasta Luego! The ride to and tour of Teotihuacan with Mario was terrific. My wife and I traveled with our two young children (ages 5 and 3) and Mario was very accommodating. He explained so much about Mexico City as we were traveling out of the city and was very detailed in his discussion of Teotihuacan as well. This trip was the perfect close to our week-long visit to Mexico City. TOUR GUIDE RESPONSE: You have a great kids are very good travellers and I hope see you again to show you more of my amazing country. Hasta luego! Mario was a knowledgeable guide and it was a very comfortable trip. We learned more about the pyramids than we expected. We went on the spring equinox and Mario's timing allowed us a view of the site before the crowds arrived. We also learned a lot about the areas that we were traveling through. Mario was very accommodating to our abilities and questions and adapted the visit as necessary. We would be happy to have Mario as a guide when we return to CDMX. TOUR GUIDE RESPONSE: And another interesting places in my country are waiting for you. Hasta luego! Mario was mature, knowledgeable, courteous, friendly, prompt, efficient, accommodating, and passionate about his culture and people. I feel honored that he shared his love of Mexico City and the pyramids with me. I learned so much in such a short time. I would never have seen or understood a fraction of what I did without Mario. Best tour guide I have ever had. Mario was a good tour guide and showed great knowledge. He was quick to respond to our emailed questions before the trip and was flexible with the itinerary on the day of the trip. I originally chose Mario because of his reasonable pricing compared to other tours and his high ratings. He did not disappoint and I highly recommend him. TOUR GUIDE RESPONSE: You are very kind with me. Tks. Mario was excellent and I highly recommend this as the perfect way to visit Tehotihuacan. He picked us up on time at our apartment and gave is some local history on the drive out. Once at the site he happily took my mother to visit the museum as I climbed to the top. He was very informative and made for a real enjoyable experience. Thanks to Mario for an informative tour. He was on time and we got an early start to see the pyramids which he was able to share a lot of information on. TOUR GUIDE RESPONSE: I really love my job and help you to see the most important of this prehispanic cultures. We had an early morning tour with Mario and it was the perfect time of the day to visit pyramides before big crowds arrive. Mario was a very knowledgeable guide who also went out of his way to drop us off at the airport in the end. We would highly recommend his tour! TOUR GUIDE RESPONSE: you are very kind with me. Thank you! Mario was wonderful. Informed, patient, kind... Couldn't have had a nicer day! TOUR GUIDE RESPONSE: Many thanks you are very kind with me. Mario was well informed and we enjoyed our tour of the ruins/pyramids. TOUR GUIDE RESPONSE: your are very kind with me. I thought he was very kind and nice. He arrived on time and was very flexible! Mario was prompt and professional and provided a nice tour of the Teotihuracan. We were first to site (opens at 0730) and had the place to ourselves. Wonderful experience of climbing to the top of the pyramids and being the only person there. TOUR GUIDE RESPONSE: you are very kind with me. Mario was terrific. He was prompt on pick up and communicated well beforehand. As a party of 5 our children are 6,6,4 and he was wonderful and engaging with them as well as us. Good English skills. Clean and comfortable minivan. He was very helpful while touring and made the visit more meaningful with his broad knowledge and stories. Mario also set up lunch at La Gruta for us and thankfully sat with us to help with menus and continue conversations. We highly recommend Mario P! TOUR GUIDE RESPONSE: You are very kind with me. I really love my proffesion and I give my best with a new client. Mario is a great guide with tons of knowledge. He is in love with his profession and Mexico City where he has grown up. We highly recommend him as a guide. Also we enjoyed a comfortable car and Mario's flexibility. Thank you , Mario, we had a great time! TOUR GUIDE RESPONSE: You are very kind with me I hpe see you soon. Our family of 5 had a wonderful tour of Teotihuacan and Guadalupe Basilica today. We would highly recommend Mario. He was very professional, knowledgeable, and a pleasure to be with. We would not hesitate to engage him again. TOUR GUIDE RESPONSE: My philosophy as tourist guide is help the foreigners to understand the backgrounds of my prehispanics cultures and the results of mix with the spaniards creating a great country. Mario took us to the pyramids on our last day in Mexico City. He had his own car to drive us there and provided extra bottled water, which we drank all of! Mario is friendly and knows a lot of information about the pyramids. A profoundly nice guy and a real pro as a guide. We had grandparents w us and he was able to balance helping us look after them as well as make sure everybody had a good time. Good clean car and lots of knowledge. He made everybody feel safe, comfortable which allowed everybody to have fun. Also worked w us when we had to change plans. TOUR GUIDE RESPONSE: You are very kind with me, Thank you! Mario was punctual, courteous, and came with a spacious and clean vehicle. He had a good knowledge of the areas of the tour. His language was somewhat difficult to understand and his responses to questions were sometimes difficult to follow or off point. We enjoyed our time with Mario, but I wouldn't recommend him unconditionally. TOUR GUIDE RESPONSE: In that moment you should have asked me to repeat for you correctly and I would give you all the information. Thank you for the review. Highly recommended. Kind and very flexible. Adapted everything according to our needs. Comfortable car also. It was a wonderful experience, a very thoughtful guide, we can only warmly recommend him to others. Mario is an excellent tour guide. We would recommend this tour as it was outstanding and he covered all the important information with us. He also gave us information for our next few days in Mexico City which turned out to be extremely helpful. Mario is the ultimate gentleman, a kind and helpful guide for this 75-year-old traveler who is not too comfortable on uneven paving surfaces. He made sure I was well looked after and supported as we toured this ancient site. Occasionally, I had difficulty following his syntax when I asked questions in English, but I could fill in the blanks on the Internet.the half-day option is a great way to go because you avoid a lot of traffic. TOUR GUIDE RESPONSE: Thank you for the rating and comment. You are very kind with me. Thank you for this great feedback, it'll help me become better at what I do. Mario was excellent! He shared with us his great knowledge of Teotihuacan - and of other sights along the way to and from our apartment. He was very prompt, and he accommodated our desires along the way - such as for taking time to shop a bit. We would be very excited to work with him again - a true professional with a personal touch! TOUR GUIDE RESPONSE: Mathew, Your very kind with me. Many thanks! TOUR GUIDE RESPONSE: In your future trip to my country I have experience in much more tours all over my country Thank you, Mario. Thank you for a great tour. Your knowledge of the area was impressive and it made the time even more interesting and enjoyable. TOUR GUIDE RESPONSE: You are very kind with me, I love my job in this wonderful country! TOUR GUIDE RESPONSE: Dave and Debie, This my mission make you feel in your home! Thanks, Mario. Mario was a fantastic tour guide! He was patient with all our questions and took us to the coolest spots. I would highly recommend him! TOUR GUIDE RESPONSE: Roshni, you 're so kind with me please be happy all time! Mario was a great guide for our day in Teotihuacan. He was well informed about all the major sites and also provided lots of anecdotes from his extensive experience guiding this tour. He also suggested a delicious, less touristy, lunch spot which was very enjoyable. His English is very good as well. You will not be disappointed on your tour with Mario. TOUR GUIDE RESPONSE: Gabriel, many thanks! We want to thank you for the wonderful guided tour yesterday. We really enjoyed the visit to Teotihuacan and the history behind the pyramids. The additional information about the history of Mexico and the general area was very interesting and informative. The restaurant you recommended was excellent. A great experience! TOUR GUIDE RESPONSE: It was my pleasure Marcus, I thank you very much that you were satisfied with my work. I had a great time with you too.